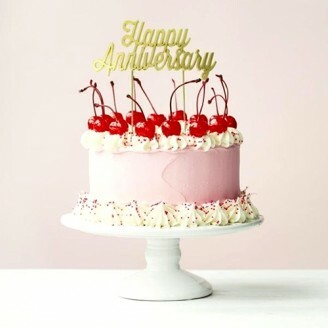 No more squiggly writing with icing and spelling mistakes on your anniversary cake. Beautiful anniversary cakes deserve this beautifully crafted Happy Anniversary Cake Topper. The cake topper adds to the beauty of the cake. The frugal amongst you please note, if you store it with care; the cake topper can be washed and reused, year after year. We are presenting you the beautiful cake with anniversary topper to make your loved ones feel special. It is a time to twist in the mood of love and cheer with a beautiful cake with happy birthday topper for a partner. If you are confused how to express your feeling towards your loved one then take the help of this cake. Spread the magic of love on your better half by ordering this cake.